Oldham Athletic moved to within a point of League One safety after edging a fiercely competitive draw with leaders Burton Albion. Both sides hit the woodwork before the break, the Latics from a corner that bounced to safety off the far post and Albion through Tom Flanagan's header. But chances were at a premium with just one shot on target throughout. The Brewers, who are four points clear, would have restored a six-point lead over second-placed Wigan with a win. But they remain seven points ahead of third-placed Walsall. Mark Duffy did force Oldham keeper Joel Coleman to palm away a 20-yard free-kick in the second half. But the visitors, who still have two games in hand on fifth from bottom Blackpool, were good value for a point. "We probably had the best training session yesterday morning that we've had since we arrived, and that worried us because if you're that good on the Friday you're usually not that good on the Saturday. "It just happens sometimes. You've seen the honesty of the players all season and they're as disappointed as anything. "But, as I say, it just happens as a footballer sometimes." "I think we definitely deserved something out of the game. We looked good. "We knew the importance of trying to get something from the game so I'm pleased we've come out with something. "I think a lot of people probably expected us to get beaten but I think we've shown we're a half-decent side." Match ends, Burton Albion 0, Oldham Athletic 0. 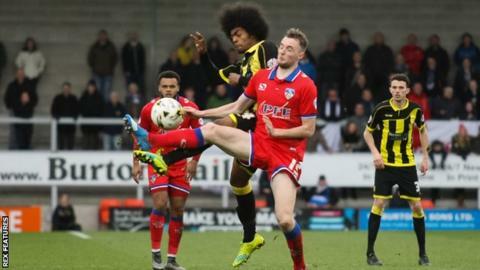 Second Half ends, Burton Albion 0, Oldham Athletic 0. Corner, Burton Albion. Conceded by James Wilson. Corner, Burton Albion. Conceded by Curtis Main. Corner, Oldham Athletic. Conceded by Damien McCrory. Corner, Burton Albion. Conceded by Tareiq Holmes-Dennis. Corner, Burton Albion. Conceded by Brian Wilson. John Mousinho (Burton Albion) wins a free kick on the left wing. Curtis Main (Oldham Athletic) is shown the yellow card for a bad foul. Substitution, Burton Albion. Mason Bennett replaces Hamza Choudhury. Attempt missed. Damien McCrory (Burton Albion) right footed shot from the centre of the box is close, but misses to the right. Substitution, Oldham Athletic. Jake Cassidy replaces Aaron Holloway. Substitution, Burton Albion. Robbie Weir replaces Tom Naylor. Tareiq Holmes-Dennis (Oldham Athletic) wins a free kick on the left wing. Tareiq Holmes-Dennis (Oldham Athletic) wins a free kick in the attacking half. Attempt missed. Stuart Beavon (Burton Albion) header from the centre of the box is just a bit too high. Attempt blocked. Mark Duffy (Burton Albion) right footed shot from the left side of the box is blocked. Corner, Burton Albion. Conceded by Cameron Dummigan. Corner, Burton Albion. Conceded by Joel Coleman. Attempt saved. Mark Duffy (Burton Albion) right footed shot from outside the box is saved in the bottom left corner. Foul by Brian Wilson (Oldham Athletic). Corner, Oldham Athletic. Conceded by Lucas Akins. Attempt blocked. Liam Kelly (Oldham Athletic) right footed shot from the centre of the box is blocked. Attempt blocked. Hamza Choudhury (Burton Albion) right footed shot from outside the box is blocked.